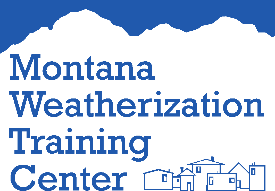 Weatherization 102 provides a brief review of weatherization measures, standards and residential building performance practices. The remainder of the course focuses on immersing students into practice scenarios. Tools and techniques of weatherization, including blower door use, air sealing options, insulation alternatives, proper ventilation, and mechanical issues and CAZ testing are all covered. The course follows the Department for Energy’s standardized curriculum for Weatherization Installer/Technician Intermediate and has been modified to align with the NREL Job Task Analysis for Retrofit Installer Technician. Upon completion of the class, students will have hands-on experience performing the most common weatherization applications. The structure of the course is mini-lecture followed by hands-on skill sets with instructor critique. This is a lecture-lab course. Lecture topics are presented in the classroom setting followed by hands-on practice in the lab. The class is appropriate for students who have had a basic introduction to weatherization training and are ready for advanced “hands-on” training. Student participation in discussions in the classroom and in the lab exercises is very important. This course has a written final exam and student participation is graded as pass/fail.